Von 4* auf 5* : Favorit: "This Ain't A Scene, It's An Arms Race"
"thnks fr th mmrs" "i'm like a laywer... (me & you)"
Die Platte baut verdammt schnell ab. Inzwischen find ich es nur noch langweilig. Gutes Album, vorallem die zweite Hälfte gefällt mir. Muss aber trotzdem abrunden, 4*. 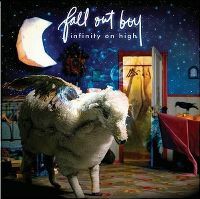 Das erste Album, das ich mir von Fall Out Boy angehört habe - und ich bin begeistert. Habe ich mittlerweile schon einige Male rauf und runter gehört. Ohne Zweifel haben die Jungs hier gute Arbeit geleistet - kein Track verdient weniger als vier Sterne. I find de hom voooi de geile stimm! 3.3* wert, durch die bank (mit 2,3 leichten ausnahmen) durchschnitts-pop/rock.. This album was awesome. One of the best albums of 2007. Amazing album with so many fantastic songs. A great way to follow up From Under The Cork Tree, though is just falls short of it's predecessor's level. The standouts here are plentiful, but the best three are I'm Like A Lawyer..... G.I.N.A.S.F.S and This Ain't A Scene It's An Arms Race. pretty solid album! a lot of the songs sound the same though and it is a little let down from from under the cork tree (despite experiencing overwhelming success). An extremely good album from Fall Out Boy. I was a massive fan of Fall Out Boy at the time but in retrospect this was a great album then, now and hopefully into the future. So good that IMO there is not a bad track that ruins the whole experience of listening to it. Especially like the songs This Ain't A Scene, Thnks fr th Mmrs, I'm Like A Lawyer, The Take Over the Breaks Over, Thriller and I've Got All this Ringing in My Ears.